Home Dinagyang Festival 2017 Ilo ilo Travel Visayas. Philippines Ilo-ilo City Sights and sounds of Dinagyang Festival - Must Experience! Ilo-ilo City Sights and sounds of Dinagyang Festival - Must Experience! ILOILO CITY—It’s the merriest time of the year in this capital of Iloilo province as about a million Sto. Niño devotees, spectators and revelers poured into the streets for this year’s Dinagyang Festival. The festival highlights the Kasadyahan contest—a showcase of festivals, products and history of participating towns—that was held yesterday and the Ati tribe competition slated Sunday. The Dinagyang, one of the festivals held in January in honor of the Sto. Niño (Holy Child Jesus), is known for the colorful brisk performances of Ati tribes in a street dance competition. The groups and tribes competing in the two major events performed in five judging areas: Freedom Grandstand, in front of the Iloilo provincial capitol, corner Mabini and Delgado Streets, corner Quezon and Ledesma Streets, and in front of the Maria Clara stage. Ten groups joined the Kasadyahan Regional Cultural Competition Saturday. These were Tribu Salakayan of Miag-ao town in Iloilo province, Tribu Tatusan (Caluya town in Antique province), Tinabu-ay Festival (Murcia town, Negros Occidental province), Pintados de Pasi (Passi City in Iloilo), Tribu Manog-Gama (Maasin town in Iloilo), Tribu Patabang (Tapaz town in Capiz province), Hubon Ninagtong sa Manggahan (Nueva Valencia town in Guimaras province), Tribu Haw-as (Dumangas town in Iloilo), Tribu Dos Once (San Carlos City in Negros Occidental) and Masskara Festival (Bacolod City), a noncompeting guest performer. Ten tribes are competing for the championship in the Ati tribe competition Sunday. These are Paghidaet of La Paz National High School, Obreros of Barrio Obrero National High School, Pan-ay of Fort San Pedro National High School, Amihan of Mandurriao National High School, Buntatalanit of Tiu Cho Teg Ana Ros Foundation Integrated School, Salognon of Jaro National High School, Dagatnon of Ramon Avanceña National High School, Panayanon of Iloilo City National High School, Ilonganon of Jalandoni Memorial National High School and Abiador of Asian College of Aeronautics. Two guest tribes are also performing Sunday. Security measures had been tightened in the city. Police said they asked telecommunication companies to shut down mobile phone signals during the festival’s main events, from 6 a.m. to 2 p.m. on Saturday and Sunday. Senior Supt. Remus Zacharias Canieso, chief of the Iloilo City police, said specific security measures depended on the local police’s security risk assessments. “We had not received reports or monitored threats,” he said. Cell phone signals were shut down in specific areas, lasting for several hours, in Cebu City during the Sinulog Festival last weekend as part of the security measures against explosive devices detonated through mobile phones. The move came after the twin blasts in Hilongos town in Leyte province on Dec. 28, which left 32 people watching a boxing match in the town plaza wounded. Police said two improvised explosive devices were used in the bombing. 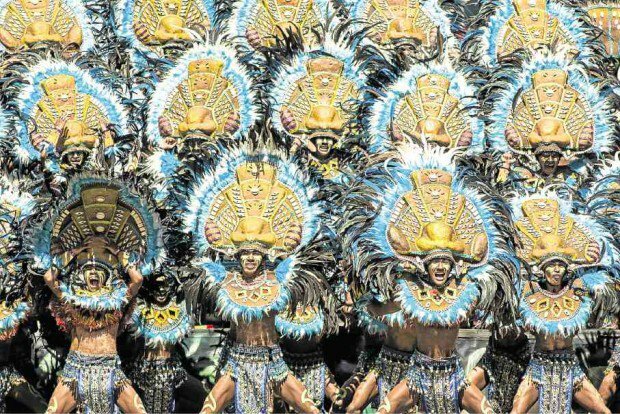 The Iloilo police have banned canned and bottled drinks during the Dinagyang Festival to ensure the safety of spectators.